Max-an elderly Paris bookstall owner-is abducted at gunpoint. His friend Hugo Marston, head of security at the U.S. embassy, looks on helplessly, powerless to do anything to stop the kidnapper. Marston launches a search, enlisting the help of semiretired CIA agent Tom Green. Their investigation reveals that Max was a Holocaust survivor and later became a Nazi hunter. Is his disappearance somehow tied to his grim history, or even to the mysterious old books he sold? On the streets of Paris, tensions are rising as rival drug gangs engage in violent turf wars. 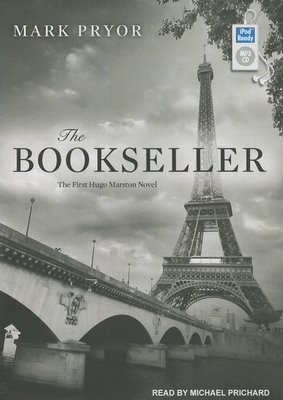 Before long, other booksellers start to disappear, their bodies found floating in the Seine. Though the police are not interested in his opinion, Marston is convinced the hostilities have something to do with the murders of these bouquinistes. Then he himself becomes a target of the unknown assassins. With Tom by his side, Marston finally puts the pieces of the puzzle together, connecting the past with the present and leading the two men, quite literally, to the enemy's lair. Just as the killer intended. Mark Pyro is an assistant district attorney with the Travis County District Attorney's Office in Austin, Texas, and the author of the true-crime book "As She Lay Sleeping."